Abstract: The specific features of agricultural sector are provided in the International Accounting Standards and Financial Reporting Standards IAS/IFRS, these standards being respected by multinational companies and listed companies that will need to prepare their financial reporting set according to IAS / IFRS. 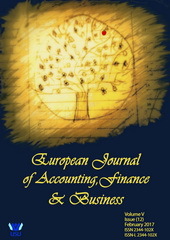 The main piece of roumanian legislation regulating the accounting system is The Accounting Law number 82/1991. Currently, financial accounting in Romania is regulated by O.M.F.P. 1802/2014 organized in a uniform manner across all economic sectors, with a single chart of accounts applies to all businesses, including those specific to the agricultural domain. In this paper the main objective is to point out, on the one hand the terms relating to agricultural activity, and on the other to realize a structured presentation of the main accounts from othe General Chart of Accounts used in agricultural activity in Romania. Abstract: Fraudulent financial reporting practices can have significant consequences for organizations and all stakeholders, as well as, for public confidence in the capital and security markets. In fact, comprehensive, accurate and reliable financial reporting is the bedrock upon which our markets are based. Keen to project a rosy picture of the Satyam to investors, employees and analysts, Mr. Raju (CEO and Chairman) fudged the account books so that it appeared to be a far bigger enterprise, with high profits and fast growth rate, than it actually was. The Satyam fraud has shattered the dreams of different categories of investors, shocked the government and regulators alike, and led to questioning of the accounting practices of statutory auditors and corporate governance norms in India. This is an exploratory study based on secondary sources of information. An attempt has been made to provide an explanation for various intriguing questions about Satyam scam. After thorough investigations by the CBI and SEBI, they have unveiled the methodology by which Satyam fraud was engineered. Finally, we recommend "Fraudulent reporting practices should be considered as a serious crime, and accounting bodies, courts and other regulatory authorities in India need to adopt very strict punitive measures to stop such unethical practices." Abstract: The purpose of this article is to show how important intangible assets are and how much they can change these "invisible" the way assets, organizations, cities and countries are valued. Starting from the issue of the cross-border transfer of intangible assets and implicitly by brands, we aim to show how brands influence the economic evolution of the companies and which were the most important purchases of internally generated brands or brands that have plunged some countries into the most intangible countries in the world.